The Starter Tethering Kit from Tether Tools will help you seamlessly transition into a tethered workflow and provides the basics you need to get started. 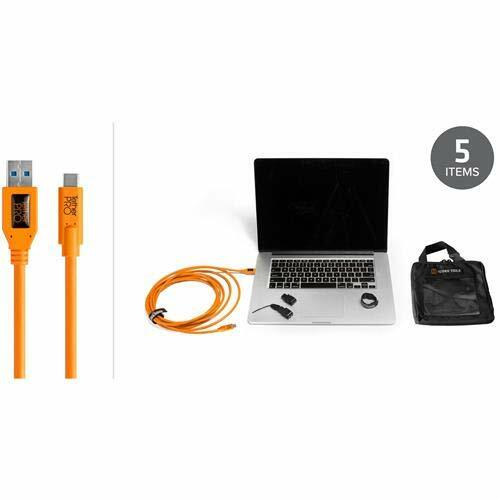 The Easiest Way to Get Started Tethering Choice of TetherPro Cable TetherPro USB & FireWire cables are premium quality and designed for high capacity photo transfer at fast speed while shooting tethered. Gold plating and ferrite cores reduce noise and signal errors for the most reliable tethering experience. JerkStopper Cable Management JerkStopper Camera Support removes the stress and strain from a cable or cord, ensuring the plug stays in your camera JerkStopper USB Support removes the stress and strain from a cable or cord, ensuring the plug stays in your laptop JerkStopper ProTab Cable Ties - Small (10pk) are ideal for thin to medium gauge cables and cords such as A/C, USB, HDMI and music cables up to about 15' (4.6m) in length Cable Organization Case (Standard) The Cable Organization Case (Standard) is an easily accessible, durable storage case for cables, straps and JerkStoppers. Keep gear together, the Cable Organization Case fits nicely inside all of the Tether Table Aero Storage Cases. Tethering Software - Optional Add-on Tethering requires software support.